My name is Louise Fogerty; I was born in 1994 in Bedfordshire, (UK) and grew up in the Hertfordshire area where I am still residing. After finishing my A levels in 2013, I took a gap year in my education where I stand currently as a prospect animation student with lifelong hopes of entering into the industry in the near future. As a child, I had always been absorbed in drawing and fashioning together humorous stories in my mind given any spare moment, which all too often featured historical events or retellings of the old Viking tales of Norse Mythology. Having been introduced to Norse Mythology early on in my childhood owing to my Swedish mother, it was this that later sparked my general interest in world mythologies and in particular that of the Mexica. Around a decade ago I was inspired greatly by a memorable workshop run by Mexicolore at my old primary school, Fleetville Juniors. I have always found such visits particularly exciting, and it was one which indefinitely resulted in the development of a keen interest in Aztec culture and in turn, their wild and beautiful mythology. It was one of those workshops that never failed to leave my mind, from the imposing replica of the renowned Aztec sun stone, to a rich atmosphere of Aztec drums and instruments; a whole array of Mesoamerican artefacts; traditional clothing; jewellery and equally colourful tales of the facts and legends behind the astounding culture of the ancient Mexica. Remembering back to this fascination I held after Mexicolore’s Aztec workshop, I felt curious to read further into the mythology of the Mexica in the late summer of 2013 and felt instantly drawn to producing several fun pieces of art. These I posted on DeviantArt, an online art community with members from all corners of the globe sharing their art with others of similar interests. 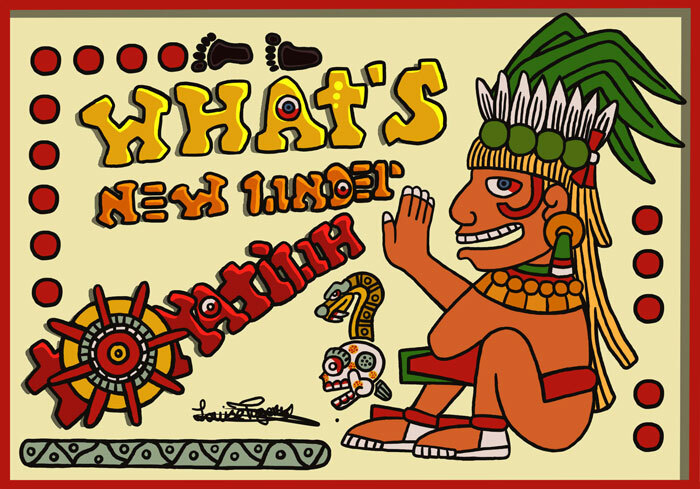 ‘What’s New Under Tonatiuh’ is a quirky online comic strip which I created during my gap year after a sparked interest in my comical portrayal of the Aztec gods. While the comic exists in its early days, I hope to produce it as a weekly strip exploring both humorous versions of the concepts found in the myths as well as original material involving the often daft activities of various individuals in the pantheon and the present sun god, Tonatiuh. 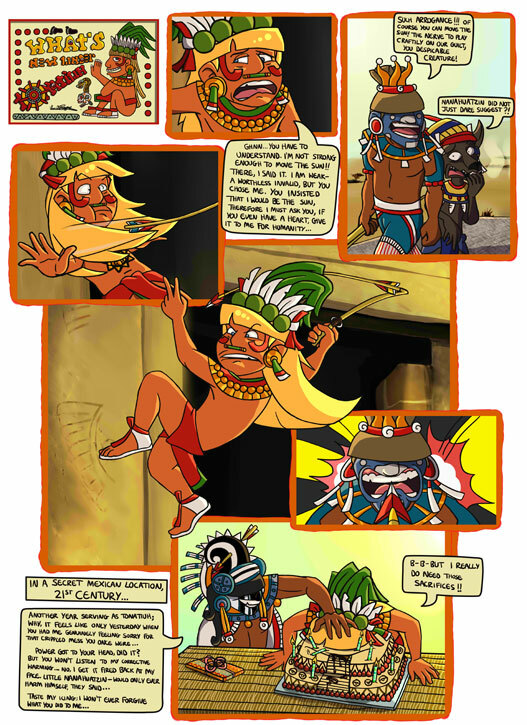 Unwittingly, Nanahuatzin’s misfortunate calamities placed him as the figurehead of the comic strip in his mostly reincarnated form as the golden haired Tonatiuh, and this presents in itself a running gag of trouble for the little sun god. Perhaps someday in the distant future it would be delightful to foresee the production of an animated series if interest persists. There is most certainly a gap in the market for successful creative media involving the Aztec gods, and in pursuing the animation field, it would be a dream one day to make this a reality. Currently, ‘What’s New Under Tonatiuh’ can be found on my DeviantArt page or on Tumblr where I update my comic in its own blog. It is my pleasure to work on this project and to share with you a funny yet informative adaptation of Aztec mythology. Hopefully anybody interested will enjoy reading my comic as much as I do making them. It is worth communicating a couple of related artists I befriended on DeviantArt who share a similar passion for Aztec mythology and I would thoroughly recommend visiting their pages. 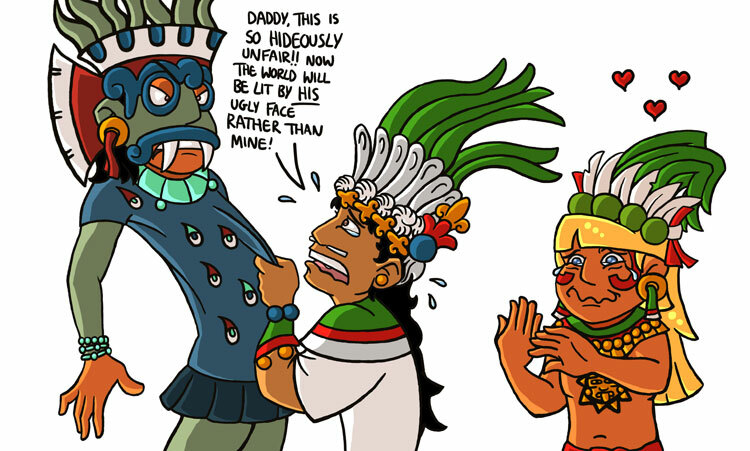 Their comic strips and personal take on the Aztec gods are thoroughly entertaining for anyone who enjoys an injection of humour into well researched mythology. Nosuku Kusunoki produces a zany Japanese manga of the Aztec gods of which an English translation can be found on her DeviantArt page. A link to her main site has also been recently featured on Mexicolore. Marisol Aranda is a young Mexican artist who creates a weekly side-splitting comic strip cunningly named ‘Nemontemi.’ Her work has served as an inspiration for me; however it is worth noting that most of her content currently reads only in Spanish. Nevertheless it is certainly worth taking a good look at both her DeviantArt and her ingeniously creative Ask Blog. The article looks fantastic - thank you so much for everything; I am so grateful for this opportunity and it means so much to me. Oh my, the links on this article are amazing! These comics are delightful. The Aztec gods are actually a pretty challenging subject since they seem more mysterious than the all-too-human Greek gods, but these artists’ humorous take on the mythology is authentic and entertaining. They’re done a great job of incorporating the colors and symbols from the originals. Great to see Aztec culture growing in popular culture in a positive way!